If you hurt your ankle this winter, don’t put off waiting to see a doctor. That’s the warning from Alaska Foot & Ankle Specialists (AFAS), podiatric surgeons located in Anchorage, Alaska. Never assume the ability to walk means your ankle isn’t broken or badly sprained. It’s best to have an injured ankle evaluated by a medical professional as soon as possible. Putting weight on an injured ankle joint can worsen the problem and lead to chronic instability, joint pain and arthritis later in life. If you don’t have access to immediate care by a specialist, then AFAS recommends following the RICE principle – Rest, Ice, Compression and Elevation – until medical care is available. 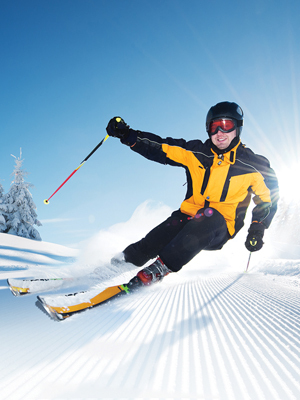 Falling during winter activities can cause ankle sprains and fractures. It is possible to both fracture and sprain an ankle from a fall, and a bad sprain can mask the fracture. Most ankle fractures and some sprains are treated by immobilizing the joint in a cast or splint. Surgery may be needed to repair fractures with significant misalignments. Surgical plates and screws allow foot and ankle surgeons to repair these injuries with less surgical trauma. With newer bone-fixation methods, there are smaller incisions to minimize tissue damage and bleeding and accelerate the healing process. For further information about ankle fractures and sprains, visit our Common Foot and Ankle Disorders.